The Keswick Country House Hotel, Cumbria. The Keswick Hotel was the wartime home of the Independent Boarding School for Girls, Roedean. The school had temporarily relocated from Brighton, East Sussex in May 1940 when its clifftop location on the south coast was believed to be at risk from German bombers on the southern side of the English Channel. About 50 or so girls were evacuated to Canada, while the rest of the school and the staff were evacuated to Keswick, Cumberland (now Cumbria) in the northern Lake District. The evacuated girls were mainly aged 11 - 16. The Keswick Hotel, owned by the Wivell family, was used as the main building, housing the Senior Girls and the staff. Other, more Junior Girls, were boarded at Millfield Hotel, Shu-le-Crow Guest House and some prefabricated huts. As well as using rooms in the Keswick Hotel for teaching, some of the other premises that were used as classrooms included the hotel garage, the Methodist Church Rooms and parts of the adjacent Keswick railway station including the waiting room. In fact the waiting room continued to be used by railway passengers even while lessons were being taught. There were some strange things that took place during WW2! A photograph of the Roedean School Shield at the Reception of the Keswick Country House Hotel, Keswick. This is a photograph of the Roedean School shield. It was presented to the Keswick Country House Hotel, Keswick, Cumbria in 1990 by former pupils and staff of the school during a 50th Anniversary reunion of the school's evacuation to the hotel from its usual home at Brighton, East Sussex. Roedean, an independent boarding school for girls aged 11 - 16, was based at Keswick Hotel during the Second World War. Between 1940 and 1945 the Hotel was the main building for approximately 350 girls and the staff of Roedean School. The motto on the shield reads 'Honneur Aulx Dignes' (Honour with dignity). The modern-day motto of the school is 'Education with imagination'. [Thanks to the management and staff at the Keswick Country House Hotel for their assistance with information about Roedean School at Keswick during WW2]. A photograph of Roedean School on display at its wartime home in Keswick, Cumbria. This photograph of the staff and students is displayed in the Reception Area of the Keswick Country House Hotel (part of the Choice Hotels Group). It was taken with the permission of the Hotel management during a visit to the hotel in December 2007. "At the outbreak of the Second World War, the Keswick Hotel closed its doors as a hotel and was used to house the staff at the Roedean School who were evacuated from their premises on the South Coast in 1940. The hotel provided a safe haven for some 350 girls between the ages of 11 and 16". For additional information about Roedean School, click on 'Comments' below. and her family in the wilds of Brookman's Park in rural Hertfordshire. We always take the opportunity to get a group photo and so, through the wonders of a timer on my camera, I once again captured a souvenir of a treasured "family get together". Kate, my oldest grand-daughter, was away up North this year and so we were not quite complete but we were loth to break with tradition, hence the attached. 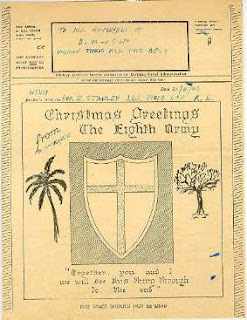 1943 from Italy it has the box at the top with their address franked by the army post office (three times I might add )and my details on the top of another larger oblong box with the words Christmas Greetings from The Eighth Army and underneath was the shield of the eighth on a black background a palm tree on the left and an oak tree on the right side underneath were these words ( together you and I we will see this thing through to the bitter end ) all the words were in old English script and it is dated 4/11/43 if only I were more knowledgeable about computers perhaps I could have posted it to the site"
Wot Mate? Like this one ? 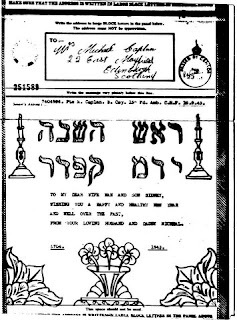 Just to set the record straight, Boabbie, who kindly sent me the Airgraph, is not related to the Caplan family but simply came across it amongst his father-in-laws effects and sent it to me as an item of general interest. The original 'definitive' ITV television series 'The World At War' was first broadcast in the UK in 1973. It told the story of WW2 through the personal testimonies of a large number of key participants - including many major statesmen of the war years, generals, ordinary soldiers and civilians. The main single exception of the contributing interviewees to having been a 'participant' was the American historian Stephen E. Ambrose (1936 - 2002). At the time the series was made, Professor Ambrose had recently finished an important study of the Allied Supreme Commander Dwight D. Eisenhower. Inevitably, only a fraction of the interviews and other material gathered during the making series actually made it into one of the 26 episodes. In 2006 the respected historian and best-selling author Professor Richard Holmes was invited to review all the interviews and data, including the previously unpublished interviews. Eventually, this has led to the publication of a new book in 2007 with a reflective commentary by Richard Holmes. The book complements the documentary series and makes an interesting read for anyone with even the slightest interest in the war years. I recently received an intriguing e-mail from Boabbie, concerning an image I had previously posted of an AirGraph that I had sent home from Italy. Bob kindly sent me the attached AirGraph that he had found in his late father-in-law's effects and I found it of much interest. As you can see, it was sent by a Pte.Caplan to his family back home on the 16th September 1943 and, like other Airgraphs of that period, it had been designed to cater for a particular occasion. In this case it was the Jewish New Year and the large Hebrew letters read as "Rosh Hashana" and "Yom Kippur" (New Year & Day of Atonement). On 3 Sep supported the movement over the Straits of the Op BAYTOWN units, the invasion of Italy. On 6 Sep the regt reverted to under command 78 Div. On 8 Sep the regt, less 90 Bty, moved to a cone area at Fumari. 90 Bty remained in defence of Milazzo port and airfield. On the 22nd and between 23 and 25 Sep moved via Crotone and Taranto to Bari and was established in a house on the outskirts of Trani. Catherine L has sent me this previously unseen poster from Palestine of the 1940's that shows how Jewish volunteers were urged to join the ATS. In all honesty, I never stopped to think that such encruitment took place so perhaps Catherine herself will tell us more about the poster by making a comment on this posting ? Written and directed by Humphrey Jennings of the Crown Film Unit (also known as GPO Film Unit), 'The True Story of Lili Marlene' was released in 1944 and given a 'U' Rating by the British Board of Film Censors. Introduced by the actor Marius Goring the film depicts how an obscure pre-war song recorded in German by Lale Anderson became the unofficial anthem of both the Axis and Allied Forces after being broadcast by the German Forces Radio Broadcasts from Radio Belgrade. As the film correctly depicts the tune was adopted by the British Eighth Army, with the soldiers and others often adding their own words in English. Also seen in the film is a British propoganda version recorded by Lucie Mannheim, and interviews with men of the Eighth Army telling what the tune meant to them. As the film was made in 1944 it was probably just a little too early for any of 'The D-Day Dodgers' versions to be included. Although 'The True Story of Lili Marlene' is probably rarely seen, it is now available on DVD. I viewed this for the first time in December 2007. Other Crown Film Unit films from the war years that are also available on DVD or video include 'The Story of an Air Communiqué' (1940), 'Britain Can Take It' (1940), 'Christmas Under Fire' (1941), Britain at Bay' (1940), 'Men of the Lightship' (1940) and 'Before the Raid' (1943). The latter film is released on the same DVD as 'The True Story of Lili Marlene'. Frank Humphrey Sinkler Jennings also directed 'The Cumberland Story' (1946) in which my father and uncle had small parts. Women's Land Army girls receive belated recognition ! An item on the BBC news states that the "Land Girls", who worked on British farms to ensure food was supplied during World War II, are to receive a commendation recognising their efforts. All surviving members of the Women's Land Army, which was 80,000-strong at its peak, will receive a special badge. They "worked tirelessly for the benefit of the nation" during the 1940s, Environment Secretary Hilary Benn said. "Their selfless service to the country deserves the recognition that this badge will represent," he added. I've told my much loved sister Polly, see photo, to apply for the long overdue badge ! I have regularly attended the annual AJEX parade at the cenotaph for the past 60 odd years but this year was unable to make it. Amongst the familiar faces that were missing on this year's Parade was Tommy Morris who carried his 95 years so well. He will be sorely missed. Tommy Morris who died in January at the age of 95 and was believed to be one of the oldest surviving paratroopers of WW2 was a familiar figure in AJEX circles.